5.0 out of 5 starsand I love it! Kay Maree is dipping her toes into the paranormal world, and I love it!!! 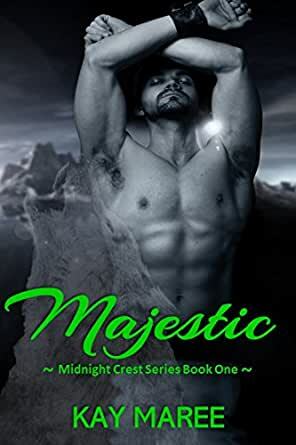 Majestic is the first book in the Midnight Crest series, and I'm so excited I can't wait for more. This book starts with Emerson, a lonely girl visiting the majestic waterfall in the town she ran off to. After the death of her parents, she lost herself. She cries for the things she has lost. A pair of liquid lead colored eyes invades her dreams, (yes, I'm quoting the book). Raff, up top of the forest, hiding from the world sees Emerson and knows in the bottom of his heart that she is his, his love, his woman, his mate. But will she love him if she knew what he is? Loved this book. Instalove! This woman has my heart! Fangirl forever!! 5.0 out of 5 starsSweet yet powerful. This was a sweet love story that draws the reader in. Emerson dealing with loneliness and devastation after a loss. Her world has changed from the fairytale life that she once had. At night the only peace that she finds comes in dreams of water and eyes of “liquid lead”. Emerson moves away to try and start a fresh life far from the place where her old life took place, she discovers a magical hidden waterfall. It draws her near and makes her feel calm and better about herself and life. Rafe is a lonely wolf shifter with loss and devastation and feelings of guilt that wont seem to leave him alone. High in the tops of the forest he lives hidden away from the world. He watches over the magical waterfall that seems to be his calming force. One day he sees a beautiful young woman at is water. It is the girl that he has seen in his minds eye, his woman, his destined mate. They by chance meet one dark night, and are pulled together and have an instant bond. This meeting starts a chain of events that may not allow them to fulfill their destiny their lives will forever be changed yet again, but to fulfill their destiny they will have to fight off the evil that has come to find them. If you are a lover of all things paranormal, this is definitely a romance for you. It is short but powerful, ad ou will want to read the next book in the series. This is the first book in the Midnight Crest series. This is the story of Emerson and Raff. Emerson is a lonely girl visiting majestic waterfall in the town she ran off. After the death of her parents, she lost herself. Raff lives in the top of the forest, hiding from the world. He sees Emerson and knows in the bottom of his heart that she is his mate, his love. Will she love him if she knew what he is? I have always loved shifter books and I couldn’t wait to read this one. I enjoyed it from the start to the end. I want more. I can’t wait to read the next book ‘Dragon’s Blood’ and the rest of the series. This is one that I would defiantly recommend. Kay Maree is a writer who isn't afraid to try different things. That's something I like about her. This time she wrote 'Majesty', a paranormal, novella long (or short) story. Writing a short romance story isn’t easy because your couple have to meet, fall in love, maybe even overcome a problem and have their HEA all in short time. Luckily, May Karee loves writing about insta love. Raff knows what loneliness is, what it is to lose someone that you care for, what guilt feels like. That’s why he lives secluded in the hopes that he will never experiences those things again but lately someone is also seeking sanctuary by the waterfall close to his home. A beautiful woman. Raff can’t help but be enthralled by her. Both he and his wolf long for her but the last thing that he wants is to hurt her and he knows he will if he gets close to her. Emerson knows what loneliness is, what it is to lose people that you love, what guilt feels like. So to escape all that she moved to another town in the hope to find some peace there. One thing that helps her find it is coming to the waterfall. Emerson finds peace there. But then one night something happens what makes that Raff and Emerson meet and that meeting will start a chain of events that will change their lives for good. But to have their HEA Raff and Emerson will first have to fight the bad. Can they save this time the person that they love? If you want to read this story you must love wolves, demons, witches and insta love romance. If you don’t then this isn’t the story for you. I, personally, found that 'Majesty' was the perfect story for in an anthology because of the short length and the fast pace of the story. I enjoy the story but the fact that it was a totally new story set in a fantasy world and with the mystery in the beginning it took me a little bit to get into the story. There was so much to discover and I missed a little more information. I would have loved, if the story had been a bit longer. I think that it would have been better if it had been a second story in a series. If you already had some feedback or understanding about the world where the story took place. But I do like the idea of this new world and the characters. The story was told in both POV’s. ‘Majestic’ is the perfect story is you don’t have much time but still wants to read a paranormal romance story. 5.0 out of 5 starsInsta love at its best. nning to end. intsa-love at its best. It's got a paranormal aspect is just amazing. Makes more unique. Emerson and Raff are two broken souls looking for the one piece to help fix them. when they meet its a explosion of needs, want and love. when people come to try and break them apart will they succeed or fail? it was an emotional read made me want to cry. I was smiling the thur most of it. Can't wait to read more from this series. I received an advanced copy for an honest review.